I know, I know. I go from not ever joining any challenges in the book community to joining two in one year! (But’s that’s usually how it goes, right?) Though while the Year of the Asian challenge has to do more with my reading, this challenge is more for my writing–my blog writing, specifically. 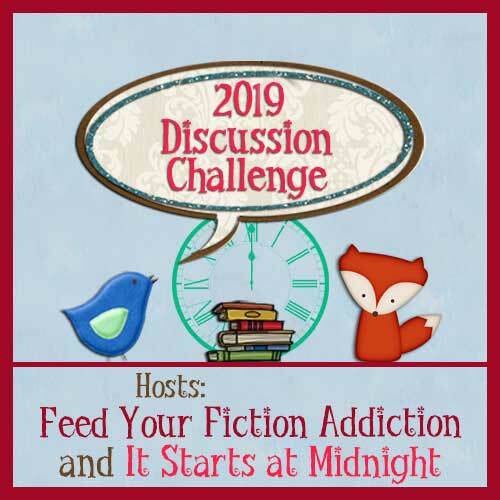 It’s the 2019 Book Blogger Discussion Challenge, hosted by Nicole @ Feed Your Fiction Addiction and Shannon @ It Starts at Midnight! It’s pretty much exactly what the title says it is. The goal is to try and write more book related discussion posts throughout the year. I’d never really been brave enough to do discussion posts before, but then a random question from my boyfriend prompted me to finally try my hand at one and then, I enjoyed it and the response so much, I wrote another one! So when I stumbled across this challenge to write more discussion posts completely by accident, I knew it had to be something I joined officially. I’m really excited for it. Discussion posts are some of my favorite to read, so not only will this challenge help me bridge my fear of writing them even more, but it’ll help me find tons of new posts to read in the process! There are a few different levels you can challenge yourself to achieve. I’m going after the “Chatty Kathy” level or 21-30 discussion posts this year. My goal is two a month, roughly (and do I get to count the two I wrote in January, even though I didn’t sign up until February? No idea, but I think I might…). There are also monthly linkups and giveaways, so hop over to the official announcement if you’re curious to learn more about it or join in yourself! Can’t wait to start discussing with you all (let’s hope I can come up with topics, eh?). You’ll come up with discussion topics easily. I think as a reader ideas will emerge from something a character said or a strange setting that prompts a question, or anything! That is true! I think I put too much pressure trying to make them these grand topics, when something simple and fun could be just as wonderful!